Games LinQ is an event transport management company that developed an app to help their drivers navigate to events, track the location of their vehicles, optimize fuel efficiency, and manage issues as they arise. They partnered with Samsung to place Galaxy tablets in 800 buses, and used Knox Configure to remotely configure these tablets to solely run their app. Transforming off-the-shelf tablets into purpose-built appliances helped ensure every athlete and official arrived on time. Games LinQ is a dedicated Event Transport Management company owned by WCL Management Services Pty Ltd. Games LinQ has managed major sporting events including the Sydney 2000 Olympic Games, 2010 World Road Cycling, 2015 Cricket World Cup and the Pan American and Para-Pan American Games. Games LinQ was awarded the largest transport contract in Queensland history to provide shuttle buses and drivers for a global sporting event on the Gold Coast. 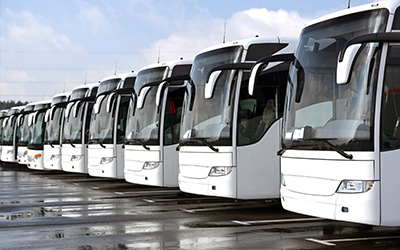 Having developed an application software system to successfully manage all the people responsible for transporting athletes and officials to and from their events, track the location of every vehicle, manage issues as they arise (i.e. blocked access to an event) and guarantee each bus departs on time, what they needed now was a technology partner. The biggest challenge was finding one big enough to logistically handle the vast number of buses required – approximately 800 – during the extensive 11-day sporting schedule. Samsung was chosen for their entire solution and consultancy offering, as well as the ease and simplicity of their devices. In fact, as little as 3-5 minutes was all the induction time most of the bus drivers needed to confidently use the devices. These included: J5 Prime smartphone, Galaxy Tab A 8” tablet, Galaxy Tab A 10” tablet. Knox Configure remotely configured the large number of Samsung tablets on every bus and tailored them to run just the one Games LinQ application, allowing Games LinQ to have these purpose built tablets ready on time. Better yet, Samsung also provided free evaluation licences so they could trial and test the platform out, which they did successfully on 120 devices, before committing to a final decision. The J5 Prime handset allowed drivers daily access to their shifts. The Galaxy Tab A 8” tablet enabled the depot yard to check each vehicle’s condition on a daily basis, including fuel consumption, emissions and vehicle performance. The Galaxy Tab A 10.1” tablet served as the primary in vehicle technology device complete with satellite navigation directing every driver from the start of their shift to the end. Samsung delivered everything we needed and more without any issue on our part. From the moment we touched base they responded to everything. They have always been available and responsive. First and foremost, Games LinQ’s priority is safety. The contracted major sporting event was on high security alert, and with over 800 buses operating in a very busy and congested area, the safety of the passengers and vehicles relied heavily on the quality of communication systems. Another measurement of success was the technology standing up against an immense amount of obstacles including traffic, congestion and unexpected delays, delivering not just every bus on time, but every athlete and official to every event smoothly.